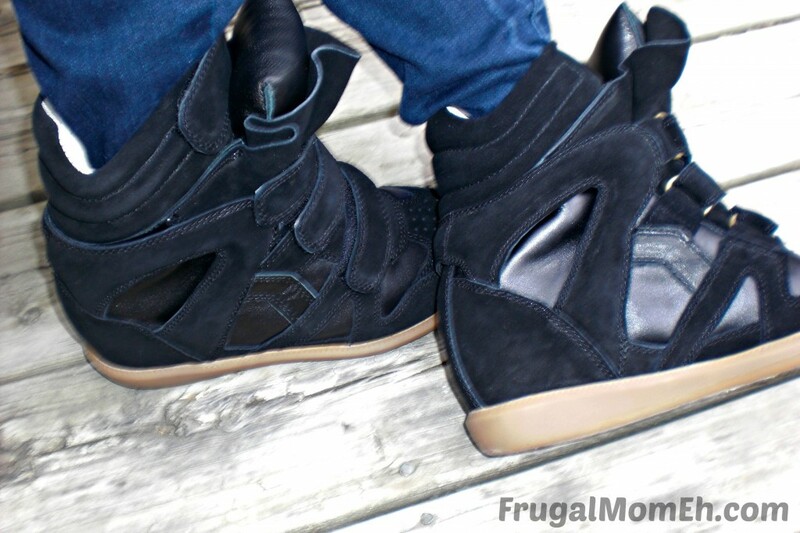 UPERE Wedge Sneakers Review - Frugal Mom Eh! Have you ever read the Shopaholic series of books by Sophie Kinsella? For those who have not, the series focuses on a woman named Becky who is obsessed with shopping. She reminds me a lot of myself; at least when it comes to shoes anyway. I have a giant collection of heels, wedges, flats, sandals, runners etc… When I see a shoe sale, I just can’t resist myself! Imagine my glee when approached by UPERE, a new fashion brand established in 2012 which specializes in trendy wedge sneakers for women. I knew these shoes would fit in perfectly with the rest of my collection of sneakers which are all unique and trendy in their own ways. I was excited when they arrived, carefully individually wrapped, to try them on and see how they fit. 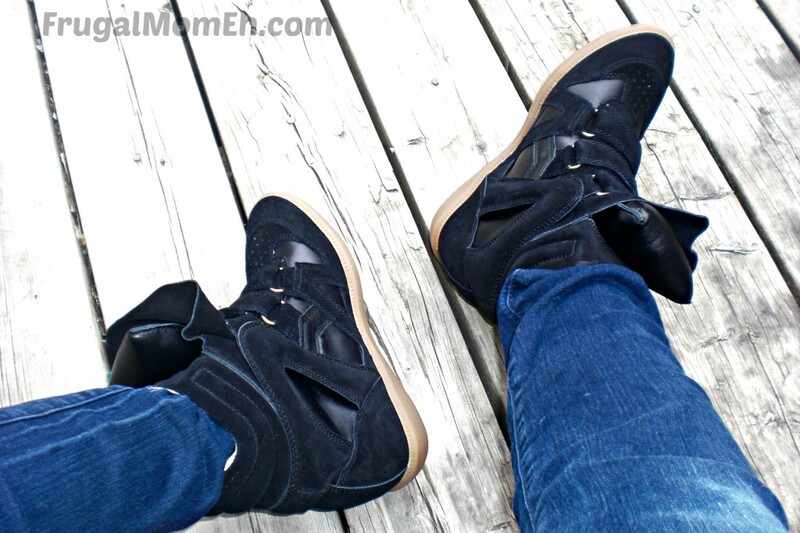 These Upere black wedge sneakers feature a black suede upper with a 2 inch hidden heel and an anti-slip rubber sole. I love that these shoes feature velcro straps rather than laces, it makes getting them on and off a breeze. I was worried that the heel would make them uncomfortable or awkward to walk around in but this was far from the truth. They are shockingly comfortable and I don’t even notice the heel when walking around aside from the nice little height boost. I really couldn’t believe just how comfortable these shoes were nor how great they looked with my skinny jeans on. Having worked for several years selling shoes I can easily tell when a shoe has been manufactured with quality materials and care and these Wedge Sneakers actually impressed me in both areas. Not only is the outer shell of the shoe made of genuine suede leather, but the interior of the shoe as well as the insole is just the softest leather. It’s not often that you come across a shoe built like that these days. Totally worth every penny of the $191.98 price tag. 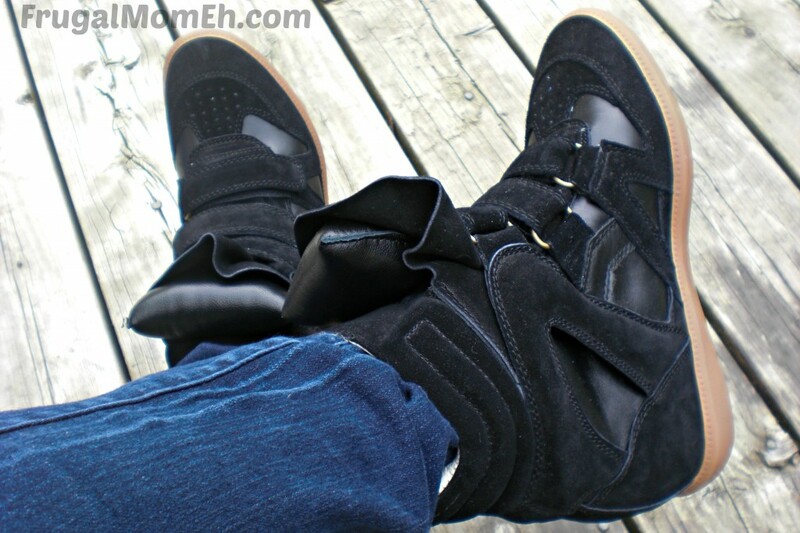 UPERE wedge sneakers also come in some really bold colours that I kind of love such as Cobalt, Gold, and Red! Right now you can get 15% off by using the discount code UPERE. To keep up to date with all things UPERE make sure you follow them on Facebook, Twitter and Pinterest. I was unsure about these, but they look great on you! Great look for you, thank you for your good review and it’s really our honor to work with you. Wow, fab trainers! I’m a jeans trainers kind of girl. I’ve been looking for a new pair for ages. These are gorgeous!